A Mini Balloon Tree Merchandiser with Quivers allows massing of such an unusual item, and an ability to attract attention. Get a look at from all angles in the gallery of views. And confirm that the lower levels had the greatest stock drawdown, or is it my imagination. If drawdown is true, it would seem children shop this fixture more than tall adults. But all age groups and heights are served. 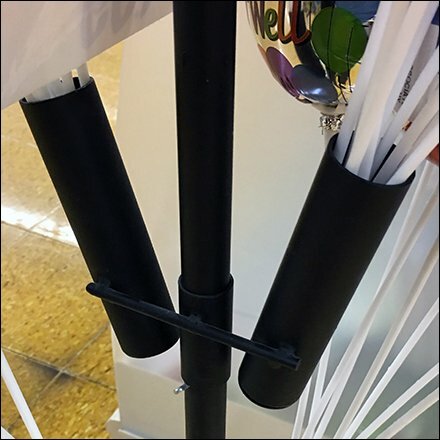 This Mini Balloon Tree Merchandiser with Quivers seen at Wegmans.